Anytime is a perfect time to satisfy your soul with a bowl of homemade soup. Soup is a filling food that has numerous benefits to a healthy diet. Soup has a universal appeal because of its convenience, low cost, and variety. Soup not only can help prevent colds and disease while controlling hunger, but it also adds much needed nutrition to your general diet. Most of all it's mmmm...mmmm... good! Homemade soup can include just about anything – fresh, frozen, or even “left over” from last night's meal. Making a large batch of your favorite soup not only fills your home with a wonderful aroma, but also lowers your food costs. You can freeze the soup and at a later date just defrost and reheat it. This will give you a head start on next week's meals. There are countless ways to enjoy a good cup of soup. A light soup served as a first course sets up your palate for the courses that follow. Soup can become a main meal by adding extra carbohydrates and protein. One day you could thicken your soup with elbow macaroni, the next day diced potatoes, then rice, barley or even stale bread. If you want a complete meal in a bowl, just remember to include a small amount of protein. Should you tire of meat as a protein you could try tofu, or a can of beans. When the weather heats up outside, cold soups such as Gazpacho and Borscht are a great summer meal too. Your Grandma always said that chicken soup is what you need to “feed a cold”. Come to find out, she was right! Homemade chicken soup has anti-inflammatory effects and can help lessen the symptoms of a cold. Vegetables soups are also packed with vitamins, minerals and antioxidants. 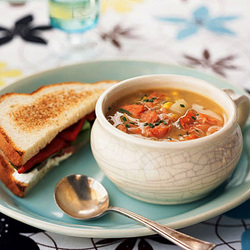 Adding a quick bowl of soup to your meals during the cold season can help you warm up and ward off those winter colds. Even more - soup can also help lower the risks of cancer and heart disease. Soup helps restore the necessary water balance in our bodies, which in turn helps keep our blood pressure (and salt content) under control as well. The protein in hearty soups helps satisfy hunger, and the nutrient rich liquid is digested rapidly and signals to your brain that you're full. Incorporating low-energy-dense foods like soup into the diet is key to calorie and fat reduction and therefore successful long term weight loss. You'll be surprised and delighted how inexpensive and nourishing your own invigorating, fresh soup can be. Make it as simple or elaborate as you wish. Pare with with its favorite two companions – salad or a sandwich – and you got yourself a cheap, easy, tasty meal. If you get into the habit of eating soup daily, your grocery bill will diminish and your taste buds will be grateful. So get creative, have fun and explore the infinite possibilities of soup! Check out some of my favorite soup, sandwich, and wrap recipes from the links above!